The Las Piñas–Parañaque Critical Habitat and Ecotourism Area (LPPCHEA), also known as the Las Piñas - Parañaque Wetland Park, is a protected area at the coasts of the cities of Las Piñas and Parañaque in Metro Manila, Philippines. The entire wetland is a declared Ramsar site under the Ramsar Convention of UNESCO. In November 1973, the Construction Development Corporation of the Philippines (now Philippine National Construction Corporation) secured a government contract for the Manila–Cavite Coastal Road and Reclamation Project. The project to extend Roxas Boulevard south to Cavite province required reclamation of foreshore lands in Parañaque and Las Piñas. Construction of the 6.6 km-long coastal road started during the term of Philippine president Ferdinand Marcos and was completed and opened to traffic in September 1985. The island was formed during construction with plans to expand the island and continue reclamation of the coastal area from Bay City to Las Piñas following Philippine Reclamation Authority's masterplan for the Southern Reclamation Project. The islands were proclaimed as a Critical Habitat by the Philippine government through Presidential Proclamation No. 1412 on 22 April 2007. It covered 175 hectares covering the two interconnected islands where important bird habitats such as mangroves, beach forests, lagoons, and mudflats are found. It was listed as a Ramsar wetland of international importance on 15 March 2013. Upon the enactment of the Republic Act No. 11038 (Expanded National Integrated Protected Area Act) on 22 June 2018, the LPPCHEA was legislated as a National Protected Area covering 181 hectares. In February 12, 2019, approximately 22 Manila Bay land reclamation projects were announced by the government, sparking criticism. Among those to be affected by the Chinese-led reclamation projects is the Las Piñas–Parañaque Critical Habitat and Ecotourism Area. The Las Piñas–Parañaque Critical Habitat and Ecotourism Area (LPPCHEA) are composed of two primary islands; Freedom Island and Long Island. The area is covered with mangroves, ponds and lagoons, mudflats, salt marshes, and mixed beach forests. 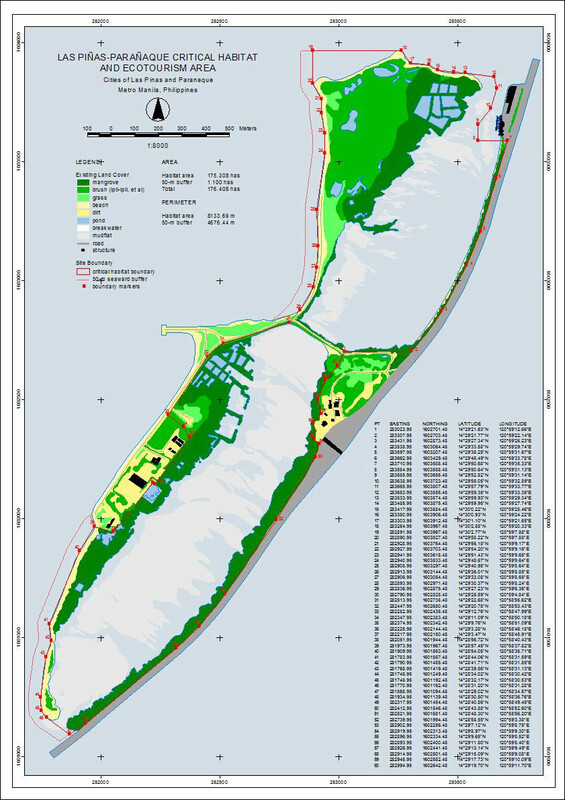 The entire LPPCHEA covers an area of 175 hectares (430 acres); about 114 hectares (280 acres) of which are by tidal mudflats, and 30 hectares (74 acres) of which are by its mangrove forest. Freedom Island located in the northern portion of the LPPCHEA in Parañaque is an artificial island formed between 1973 and 1985 during the construction of the Manila–Cavite Coastal Road. Freedom Island covers an area of about 74 acres (0.30 km2) with an elevation of between 0 and 7 meters above sea level. It is a barrier island located across from the Manila–Cavite Expressway just south of another reclaimed site called Asiaworld City, a residential waterfront community that is part of the bigger Bay City development. The island runs along the coast from barangay La Huerta at its north end near the mouth of Parañaque River into barangay San Dionisio right at the border with Las Piñas. A narrow landfill connects its southern tip to the mainland and Long Island near the expressway toll barrier. Freedom Island consists primarily of loam and dredged material pulled from the bay and nearby lands. Long Island and another smaller island also formed by land reclamation are situated south of Freedom Island and is under the jurisdiction of the city of Las Piñas. A white egret at the LPPCHEA. The LPPCHEA contains a mangrove forest and swamps providing a habitat for many migratory bird species which devises the East Asian–Australasian Migratory Flyway. There are at least 41 recorded migratory birds coming from as far as China, Japan, and Siberia in the protected area. The migration season is every August to April and there could be 5,000 individual birds daily. Among these birds are the Little Egret, Black-Crowned Night Heron, and the Common Moorhen. Among the endemic species in the area is the Philippine Duck. The LPPCHEA is the only known breeding ground for the ducks in Metro Manila. During the low tide, small invertebrates and macrobenthic species are exposed to the air which are consumed by birds and other small animals in the area. The area is also a spawning ground, nursery and sanctuary for fishes. The LPPCHEA hosts one of the few remaining mangrove forests in Metro Manila. There are 11 mangrove species in the area. These are locally known as the Bungalon, Bakauan Babae, Bakauan Bato, Pototan, Kolasi, Pagatpat, Banalo, Tabigi, Saging-saging, Buta-buta and Nilad. Nilad is a species introduced to the area by the Department of Environment and Natural Resources-National Capital Region (DENR-NCR). Only a select few salt-tolerant species of herbs, grasses, and shrubs grow in the LPPCHEA's salt marshes due to the high saline content in the area's soil. ^ "Las Piñas–Parañaque Critical Habitat and Ecotourism Area Map". Retrieved 10 May 2018. ^ "Las Piñas-Parañaque Critical Habitat and Ecotourism Area (LPPCHEA)". Ramsar Sites Information Service. Retrieved 25 April 2018. ^ a b "G.R. No. 133250". The Lawphil Project. Retrieved 4 July 2014. ^ "Cavitex". Toll Regulatory Board. Retrieved 4 July 2014. ^ "Las Piñas-Parañaque Coastal Bay reclamation project". Philippine Daily Inquirer. Retrieved 4 July 2014. ^ "Proclamation No. 1412, s. 2007 | GOVPH". Official Gazette of the Republic of the Philippines. Retrieved 2019-03-20. ^ a b c d e "Information Sheet on Ramsar Wetlands (RIS) – 2009-2014" (PDF). Wetlands International. Retrieved 4 July 2014. ^ "The Annotated Ramsar List: Philippines". Ramsar Convention. Archived from the original on 8 October 2013. Retrieved 4 July 2014. ^ "Republic Act No. 11038 | GOVPH". Official Gazette of the Republic of the Philippines. Retrieved 2019-03-20. ^ a b c d e "Las Piñas-Parañaque Critical Habitat and Ecotourism Area". Department of Environment and Natural Resources - National Capital Region. Retrieved 9 June 2018. ^ a b Fuentes, Lu-Ann; Bajarias, Mads (11 March 2015). "Metro Manila's 'secret' wildlife sanctuary—and why it might disappear soon". GMA News. Retrieved 9 June 2018. ^ a b "LPPCHEA Wetland Centre Complex". Society for the Conservation of Philippine Wetlands. Retrieved 9 June 2018.